The old slogan “You’ve come a long way, baby” could easily be applied to cannabis and the consumption of weed since it was criminalized in the 1930’s. So many new methods for growing, cultivating and manufacturing have been introduced that at times it can be overwhelming. However, one thing which has not changed much over the years is the very confusing way marijuana is weighed, measured and sold. Weed Amounts. Marijuana Measurements. As you read through this blog post you’ll see a mix of pot jargon and slang as well as a crossing over from metric weights (grams) to U.S. Customary Units (ounces and pounds) which can all be confusing. Don’t worry though! We’ve created a “weed amount chart” of some weed measurements, weed weights and weed amounts for your reference; just scroll down this post to find it! The whole point of understanding the math is so you can be an informed consumer and once you know how to do the weed measurements and costs math, you can determine if making your own marijuana concentrates, oils, edibles, and tinctures will help you save on cannabis costs based upon the price of weed in your area. Making your own concentrates is a topic for another post. The other piece of the weed measurements and amounts puzzle is how to measure the amount of THC or CBD there is in any given strain. There is a plethora of different chemicals that make up the cannabis plant, but THC (tetrahydrocannabinol) is the main psychoactive ingredient that gives users the euphoric and relaxed feeling that is commonly associated with cannabis. Average THC content in California varies between 15% and 30%, with more potent strains being created every year. The measurement of THC content in any given cannabis plant is taken as a percentage of that compound which makes up the plant’s flower compared to the other lesser-known compounds and plant matter in the flower, also known as a “bud”. When it comes to concentrated forms of cannabis like wax, shatter, hash and edibles, the weed measurements switch from a percentage to milligrams. A gram of concentrate such as shatter may be 80% THC, but it is labeled as 80mg of THC per dose. Similarly, edibles are given a THC in milligrams dose, with the average dose for edibles begin 10mg. If you want to learn more about different ways to consume cannabis, check out our “What is Dabbing” blog post or our “Beginner’s Guide to CBD Oils and Tinctures”. You can find the itineraries for our Sonoma Weed Tours here. 1/4 OZ 1/4 of weed A quarter, a quad - Hey! Do you have a quad I can get? 1/4 Ounce 4th of weed A quarter, or a quad, is 1/4th of an ounce and weighs in at 7 grams. Buying by the quarter is also very common as it allows heavier smokers to really get acquainted with a strain – an eighth can go quick! Minor price breaks can be seen at a quarter (depending on the specific dispensary or caregiver) but don't expect them. 1/4 LB 1/4 pound of weed A QP, a quarter - We're gonna score a QP! In theory, as you move up in quantity, the cost per ounce reduces, which is why some chronic tokers buy in bulk! 1/8 OZ 1/8 of shake An Eighth - "Shake" is the leafy remains of the trimming process; it can be used to make BHO/CO2 concentrates. 1/8 weed cost The cost of an eight is, typically, more per gram than larger quantities. 1/8 of weed price Pricing on eighths will in many cases be more expensive on a per gram basis than purhasing larger quantities. 1/8 ounce of weed picture An Eighth - I'm broke, do ya got an eighth for me? 1 gram of weed cost The most expensive way to purchase cannabis is on a per gram basis. 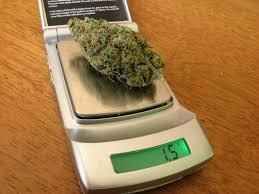 1 gram of weed size The size of a single gram of pot will vary depending on: is it ground? Is it a whole bud? Is it pieces of bud? 3.5 Grams 3.5 grams to ounces For an approximate result, divide the mass value by 28.35, so, 3.5 grams is = to 0.123459 ounces. Generally, the smallest amount you can buy loose, a gram will cost anywhere from $8 to $20, so, 3.5 grams will cost between $28 and $70. 3.5 grams of weed is called an "eighth". 3.5 loud weed "Loud Weed" relates to the aroma of the bud when you open the bag or jar. When you get top-shelf you better expect a smell that is going fill the room. It will always depend on the strain but you’re probably going to encounter a very skunky very dense smell with this caliber of kush, with fruity, sweet, or vanilla notes introduced to the mix depending in the strain. Typically, this quality of weed will cost more than a less potent bud. 30 Dollars 30 dollars worth of weed in grams 30 dollars worth of weed is just about an eighth depending on the quality of the pot and the city or region you're in. Four Way 4 way weed Four Way is a sticky genetic foursome of landrace genetics and Skunk #1. Created through the union of three Middle Eastern landrace strains (Afghani, Indian and Pakistani) plus the addition of the classic Skunk #1, you best believe Four Way produces an odor that could tip an elephant, much less fill the room it’s being consumed in. 40 Grams 40 grams of weed cost About and ounce and a quarter. 5 Sack 5 sack of weed Also known as a 'nickle sack', this refers to $5 worth of pot, which will vary in quantity depending on quality. Not an efficient way to purchase weed. 5 Week 5 week weed plant The typical weekly growth schedule is something like this: Weeks 1 and 2: Vegetation Stage followed by a new set of "weeks" 1 - X of the Flowering Stage. 7 grams 7 of weed 7 grams of cannabis weed . A quarter, or a quad, is 1/4th of an ounce and weighs in at 7 grams.